You are here: Home / Blog / Featured / How Does Radiation Therapy Work? Radiation therapy is a vital part of the treatment strategy for many types of cancer. Nearly half of all cancer patients receive radiation therapy, so it is important to know and understand how radiation therapy works. Radiation therapy works by exposing cancer cells and tumors to radiation which damages the DNA of cancer cells. The damaged cancer cells stop dividing, which halts the production of new cancer cells, and/or they die. Radiation can also damage normal cells, so radiation therapy is generally localized to the area of the body that is affected by the cancer. By taking a targeted approach, doctors can minimize the damage to normal cells. The treatment is also broken up into multiple sessions to give the normal cells damaged by radiation a chance to recover. External Radiation Therapy works by using a machine to administer radiation beams to the body. The area of the body receiving the radiation will be marked prior to the procedure. The procedure itself is very similar to getting an X-ray taken. Internal Radiation Therapy (or brachytherapy) uses a radioactive implant which is placed in the body inside of or near the tumor to deliver the radiation. The radiation only travels a short distance from the site of the implant, so damage to normal cells is minimized. This form of radiation therapy allows doctors to administer radiation to a smaller area in higher doses than they can with external radiation therapy. Systemic Radiation Therapy uses radioactive drugs that are either swallowed by the patient or injected intravenously. These drugs cycle through the body and then travel to the location of the cancer. With this form of therapy, the radiation can escape the body through sweat and other bodily fluids; for a short time after the radiation is administer, care must be taken to avoid exposing others to the radiation that is emitted from the body. Radiation can be used in isolation as a curative or palliative treatment for cancer. It can also be used in conjunction with chemotherapy and/or surgery as part of a treatment plan. Doctors understand the damage that radiation can do to the body, so prescribing radiation therapy is a decision that is made very carefully. Some things that determine whether or not radiation therapy may be prescribed include the type and size of the cancer, the location of the cancer in the body, and other factors about the patient’s health and medical conditions. Radiation therapy, like many medical procedures, has side effects. Some common side effects are fatigue, skin dryness and irritation, hair loss, and loss of appetite. Your doctor can advise you how to manage the side effects of radiation therapy. 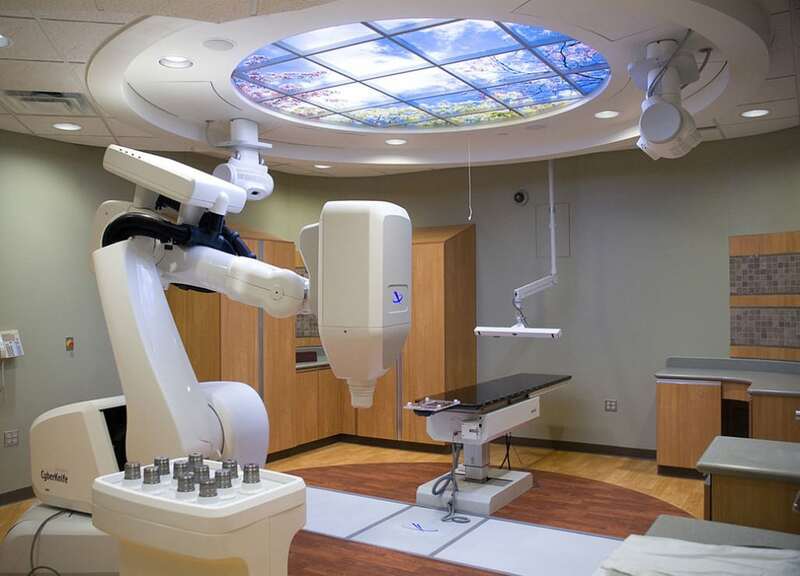 https://treatcancer.com/wp-content/uploads/2014/03/Cyberknife-Radiation-Technology-Operating-Room-1040w.jpg 749 1040 Southeast Radiation Oncology Group, P.A. https://treatcancer.com/wp-content/uploads/2015/08/SERO-logo-PNG-450x174.png 2014-06-18 05:19:552019-02-08 21:15:09How Does Radiation Therapy Work?